Glasgow and the Clyde Valley is a vast area including the largest city in Scotland, with many places of interest. Below you will find a taster of what might attract those who like historic buildings. In addition to what is described here, there are many buildings looked after by The National Trust for Scotland and Historic Scotland, on which information is easily available elsewhere. Glasgow has always been an important city, once known as the shipbuilding capital of the world, and although it did not really get established until the 1800s it has a wealth of historical buildings and in 1990 was the European City of culture and is now a top global tourist destination. 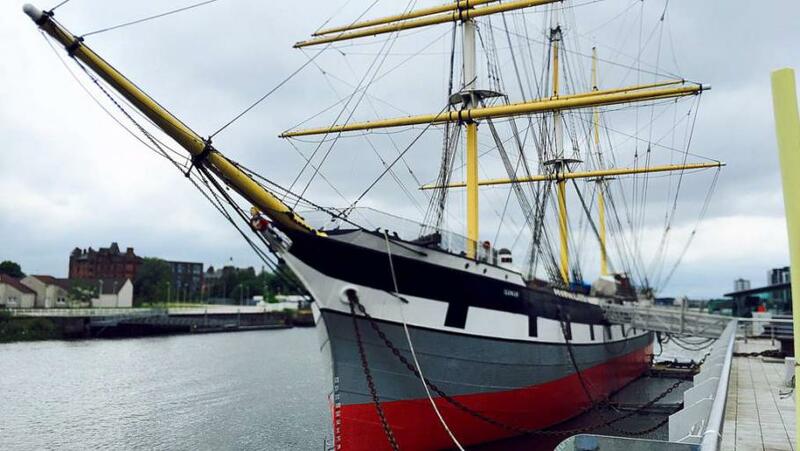 The Tall ship, Glenlee, sited at Riverside is the only floating Clyde-built sailing ship in the UK. Explore the Captain’s cabin; enjoy one of the many themed events. Listen to the history of the ship via an Audio guide, or visit the mini cinema. Under 5’s have their own play area in the hold. Round off your visit by popping into the gift and coffee shop. 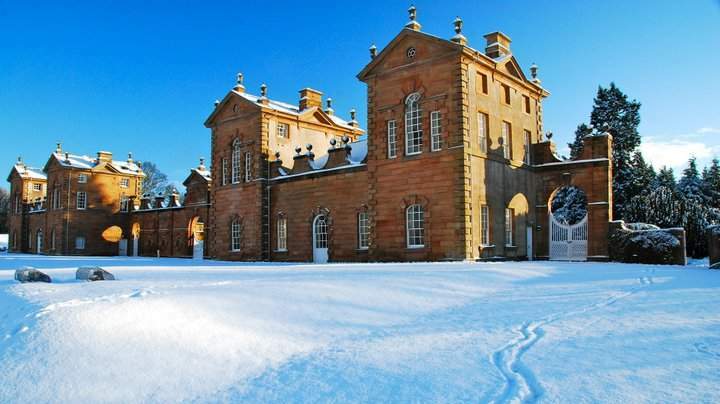 The ancestral home of the Maxwell family, Pollock House, with beautifully manicured gardens, is now managed by The National Trust for Scotland and is only three miles from Glasgow city centre. Immerse yourself in its striking architecture, lavish family rooms and world-famous private collection of Spanish paintings by Murillo, Goya and El Greco. Enjoy the collection of silverware, glass, porcelain and antique furniture. Visit the below stairs servants’ quarters, including shops and the award-winning Edwardian Kitchen restaurant. For garden lovers marvel at the collection of over 1,000 species of rhododendrons. Granted World Heritage Site Status in 2001, New Lanark is a beautifully restored 18th century cotton mill village on the banks of the river Clyde. Under the management of Robert Owen, between 1800 and 1825, the facilities and conditions for the families living and working in the village were greatly improved by introducing progressive education, larger homes, free health care, affordable food and factory reform. The mill manufactured cotton until 1968, almost 200 years. The visitor Centre brings back to life the fascinating history of the village and the ‘Annie Mcleod Experience’ is a must. The ghost of Annie appears to take you on a journey. The continued restoration and maintenance of the village is in the hands of an independent charity. Visit the Roof Garden featuring over 70 plants, a water feature and sculptures, situated on the roof of the A-listed mill. Paisley Abbey situated just seven miles from Glasgow was set up as a Cluniac monastery on the site of a 6th century Celtic church and became an Abbey in 1245. The Abbey traded extensively with Europe and was also a centre of learning – William Wallace may have been educated by the monks at the Abbey. King Robert II of Scotland was born at the Abbey following the death of his mother from a tragic riding accident. The present Queen is descended from him. The Abbey has quite a chequered history being burnt almost to the ground in the 13th century, the tower collapsed in the 16th century, the monastery was disbanded in 1560 and handed over to the Hamilton family. In the late 19th and 20th centuries restoration commenced and it is now one of the finest churches in Scotland. Chatelherault Country Park has 500 acres of countryside, ancient woodland and 10 miles of pathways and gorge trails following the course of the River Avon. It was originally built in 1732 as a Hunting Lodge and Summer House for the Dukes of Hamilton. Today a 5 star Visitor Centre takes centre place in the restored buildings including a Gift Shop and the Oaks Cafe. 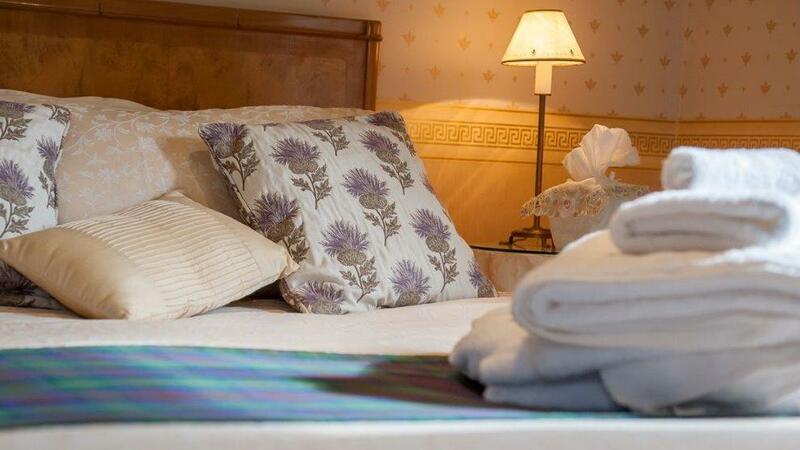 The original West Lodge houses the Banqueting Hall and the Duke and Duchess's apartments. Also visit the Exhibition gallery and Displays. Join one of the guided historical and heritage tours. For the younger visitor, from toddler to teenager, there is an adventure playground. Finally round off your visit with a picnic in the glorious parkland providing some of the most breathtaking views across the Campsie Hills, Ben Lomond and the Central Belt. In inner Glasgow, completed in 1888, is a testament to the wealth of this great industrial city. It has the largest marble staircase in Western Europe, inspired by an Italian design. For over a hundred years, this grand edifice has been the home of the'city fathers' as the council is known. However, there are public tours at 10.30 and 2.30 Monday to Friday. It is well worth joining a tour – no booking required – because very helpful guides can show and tell you about areas you might otherwise miss. For instance, one area that won’t be known to many visitors is also one of the most poignant parts of the building. Behind some potted plants, on one of the many staircases, graffiti covers part of a wall, a lot of them from 1915 and 1916. It is thought that boys from Glasgow and surrounding areas would have been here awaiting their shipment off to the Great War. This is the oldest remaining house in Glasgow, having been built in 1471 as part of St Nicolas’s Hospital. It was likely to have been used to have housed clergy for the neighbouring Cathedral. It is presently a museum housing a collection of seventeenth century Scottish furniture donated by Sir William Burrell – who donated his whole collection to the City of Glasgow and which now has its own building. Glasgow Cathedral which is the oldest building in Glasgow and Provand’s Lordship are two of the few surviving buildings from Glasgow’s medieval period. Most of the remaining medieval buildings that surrounded the Cathedral and hospital were demolished between the 18th and 20th centuries. Among the many churches in Glasgow, you might like to visit The Mackintosh Church, at Queen’s Cross, the only church he saw completed. A memorial stone was laid in 1898 and the first service for the Free Church of St Matthew was held in 1899. It is simply designed with no towering spire and may be called Modern Gothic. The roof is made up by the most striking timber-lined barrel-vaulted roof, which spans the entire forty feet of the nave. The pulpit is carved in Mackintosh designs - it is repeated five times around the curved front. It has been suggested that it represents the wings of a bird protecting young shoots - sown on fertile ground. The stained glass windows are distinctly Mackintosh in style. Public tours are available. Built in 1832, is revered the world over and considered a feat of architectural brilliance. Members of the Merchant Club, a wealthy group of individuals based in Glasgow, decided to create a Necropolis reflecting the wealth and brilliance of Glasgow at the time. With more than 50,000 people interred in its hallowed grounds, only 5,000 have a memorial erected in their memory. Bizarrely, the first person to have a memorial built in their honour doesn’t have a grave there. Robert Stevenson McGill a Professor of Theology at Glasgow University suggested a statue be built of John Knox, leader of the Scottish Reformation. This memorial became the foundation stone of the Glasgow Necropolis, known as the City of the Dead. Other luminaries with connection are Charles Rennie Mackintosh who designed a Celtic cross for a friend of his father and the author of the children’s nursery rhyme Wee Willie Winkie. The Necropolis is multi faith .Details of every single one of the 50,000 plus interred members of Glasgow’s City Of The Dead were recorded. Every name, date, gender, cause of death, date of death and profession is available in the Mitchell Library’s archives – a rich genealogy source if you have ancestors from Glasgow. Public tours are available. Delving further into the past, Roman remains can be found further out from the city. The Antonine Wall was not the first structure to be built in Scotland by the Romans, though it was by far the most impressive. Along the wall, at least four forts were built in a line between the River Forth and the River Tay in the AD 80s and between these forts, connected by a military road, were a series of watch towers. Many of the artefacts found at these sites can be found in the University of Glasgow’s Hunterian Museum. But, on the ground, foundations of Bearsden Bath House, for instance, can be seen at Roman Road, Bearsden.